Fine arts graduate from Concordia University, in Montréal, Canada, France Brodeur further studied and worked with artists and printmakers in Québec, France, Scotland and England. Exploring the interface between abstract and representational forms, particularly those found in nature and the human body, France Brodeur’s art looks through surface appearances to their human significance especially in terms of universal but deeply personal life experiences such as change and loss. 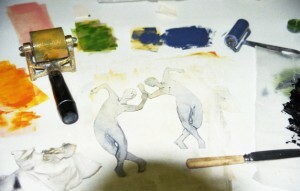 Her art, combining different printmaking techniques – etching, monotype, collagraphy, lasertrans, linotype, and a combination of those – evokes images invested with metaphorical and emotional meanings. OPC member France Brodeur’s work possesses a spirituality and deep respect for nature, that resolves itself in a poignant sense of beauty’s inherent dialogue with mutability by repeatedly stepping through and past representational appearance to dig deep into raw human experience. 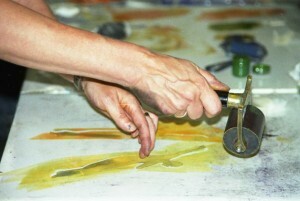 She exhibited regularly with the Oxford Printmakers Co-op. Her work has been shown as part of solo, duo and small group exhibitions in galleries and museums in Canada, Great Britain, France, Belgium and Turkey. France died in April 2014, following a long illness. She was working on her art to the last. Five weeks before her death, she gave an in-depth 50-minute talk on her artistic roots, techniques and inspiration, as part of the opening of/at the vernissage to her very successful one-woman retrospective exhibition at Ragley Hall, Warwickshire. Since her death, there has been a momentum building to do something France to mark her passing but, more, to honour her belief in life and its need to be lived and celebrated – which, in many ways, is what her art is all about. Friends of France, in conjunction with Oxford Printmakers and the Creative Alliance, are working on a project to support an up and coming young artist(s) in her name, possibly by way of a bursary to support an artist into an apprenticeship/internship, or funding for an exhibition, membership or other means of support. This project is very much in the early stages. Once details are finalised in the next few weeks, further information will be posted on this website.